Having delivered five killer albums boasting some of the most potent, technical and abrasive metal unleashed over the last decade, it would be easy for Revocation to sit back and rest upon their laurels. However, with their constant drive to push their sound ever forward and refusal to compromise their integrity, this could never be the case – and ‘Great Is Our Sin’ is their most dynamic, boundary-pushing and weighty release to date. 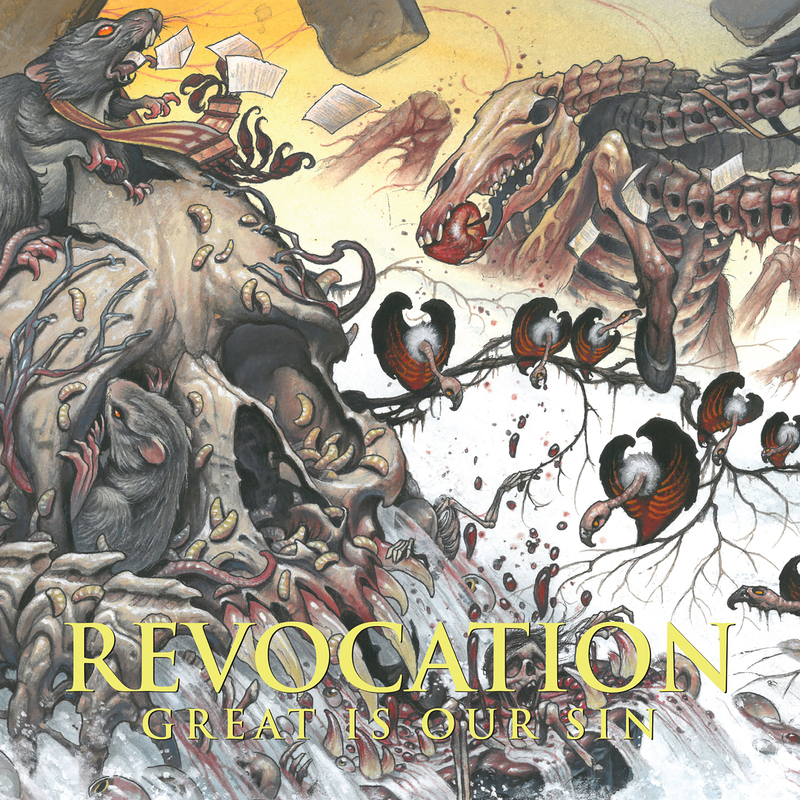 In anticipation of the release, Revocation have teamed up with Brooklyn Vegan and Invisible Oranges for an exclusive full album stream. Listen to ‘Great is Our Sin’ at Brooklyn Vegan here and Invisible Oranges here. While you are there, be sure to check out the exclusive interview with frontman Dave Davidson and acclaimed tattoo artist Tom Strom. Tom has been Dave’s personal tattooist for quite some time and designed the cover for the band’s last album ‘Deathless’ and their latest work ‘Great is Our Sin’. When it came time for the follow up to 2014’s ‘Deathless’ the quartet had their work cut out for them, and their response to the challenge is a record that grabs you by the throat and refuses to let go. Never forcing anything, the songs that would comprise ‘Great Is Our Sin’ came together organically, and while the members being spread all around North America would have been an impediment to some, Revocation drew strength from it. Have a look at the making of ‘Great Is Our Sin’ below, in which the band explains how the physical distance between the members lead to a reinforcement of their mental bond and how this influenced the writing progress. Reuniting with producer Zeuss (Hatebreed, Bleeding Through), who also helmed ‘Deathless’ and 2012’s ‘Teratogenesis’ EP, the record packs the requisite punch, yet retains the organic feel with which it was conceived. Known for their technical prowess, the band remained dedicated to upping the ante without ever losing sight of the importance of good song writing. In support of ‘Great Is Our Sin’, Revocation will be hitting the road this summer as part of the Summer Slaughter tour alongside Cannibal Corpse, Nile, After the Burial, Suffocation, Carnifex, Krisiun, Slaughter to Prevail and Ingested. The tour kicks July 23rd in Ft. Lauderdale, FL and runs through August 21st in Atlanta. 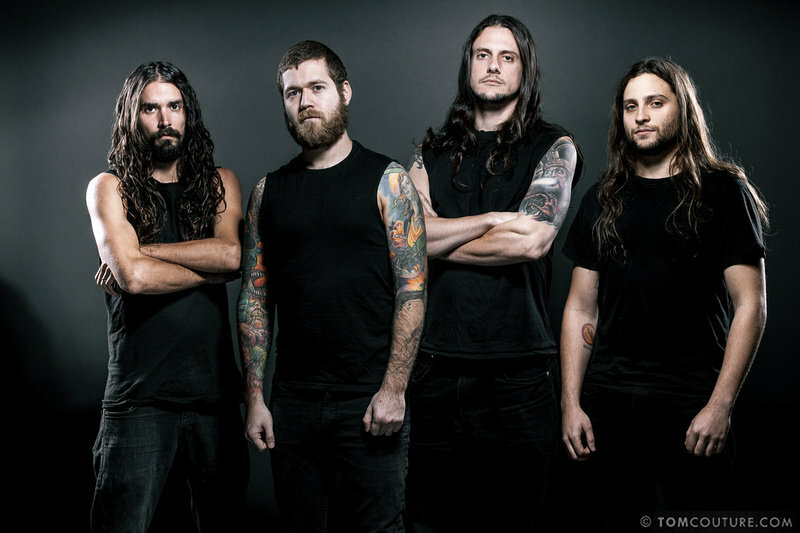 Keep up to date with Revocation‘s latest news and releases on their official website. Great Is Our Sin is out via Metal Blade Records this Friday, 22nd July. Grab your copy here.